Dr Sunirmal Sarkar is one of the busiest practitioners in West Bengal. He was a professor of Materia Medica at The National Institute of Homoeopathy in Kolkata. He sees over 100 patients per day, with more than 50 cancer cases. In 30 years of clinical practice, Dr Sarkar's tremendous success in pathological cases has compelled the rest of the homoeopathic world to witness what he is doing and how he is doing it. Dr Sarkar is a dedicated and voracious reader of the Materia Medica, Repertory, and Clinical Medicine. He is a master of Allen's Keynotes, Boericke's Materia Medica, Kent Repertory, and Pulford's Materia Medica. His affinity and desire for reading, depth of understanding, innovative thinking and extensive clinical practice, have created a unique approach, which is inclusive of his case-taking method, follow-ups, and potency selection. Jusf You See is the favorite phrase of Dr Sunirmal Sarkar while he is teaching his students. The unique style and approach he adopts in his cases and lectures is remarkable and is summarized by this very phrase. Dr Sarkar habitually gives examples of clinical situations, along with clinical symptoms of the patient. He then shows us where the peculiarity can be found, even in the black and white symptoms, and he reveals the hidden values in the pages of our Materia Medica and Repertory. Just You See symbolizes a broadening of knowledge, which brings to light the countless amounts of symptoms and approaches that Dr Sarkar uses in clinical practice. Aside from the traditional tools utilized in homoeopathic practice, such as the Materia Medica and Repertory, Dr Sarkar uses several other interesting sources such as Indian Drugs, Potentized Allopathic Drugs, Sarcodes, and Organ Remedies to name a few. For the first time, his ideas, approaches, and cases have been systematically recorded in an easy to follow style. 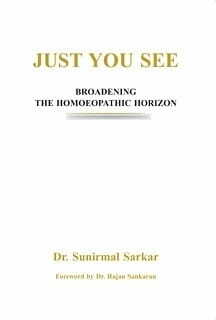 This book is entirely based on homoeopathic clinical practice and is a must read for any homoeopathic practitioner.